So, Skype for Android has been updated to support “the majority” of Android devices. Sort of. To find out if you’re on the list, try to do video conferencing and see if it works. 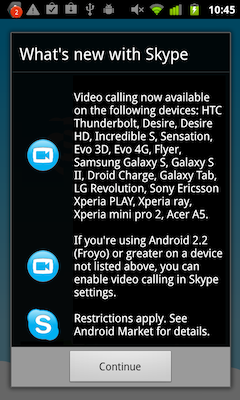 if it doesn’t, “your Android phone does not meet the minimum requirements needed to make Skype video calls”. Nice to know. Even then, though, “only the back camera of the device will work if your device is running on Android 2.2 (Froyo)”. According to Google’s developer site, 55.9% of the Android installed base is running 2.2, another 15% are running 2.1 and 3.3% are running 1.5 or 1.6. It isn’t made explicit if the 2.2 restriction also applies to 2.1 and earlier, but I presume it does. In other words, three quarters of Android’s users today will not be able to do face-to-face video conferencing with Skype, despite Skype’s best efforts and despite the phone having the cameras necessary. And there’s no real way for a user to know except to try and see if it works. More and more, Android looks like the shambles that desktop linux became, rather than the Apple-killing (almost) Microsoft.